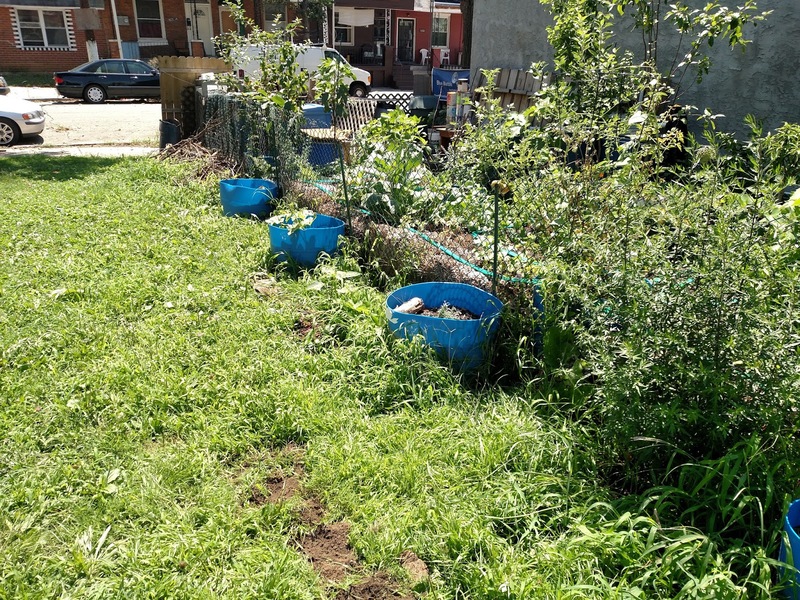 Deep in the concrete jungles of West Philly, Julie Woolhouse strategically located her guerilla gardens, or "vacant-lot gardens" as she calls them. 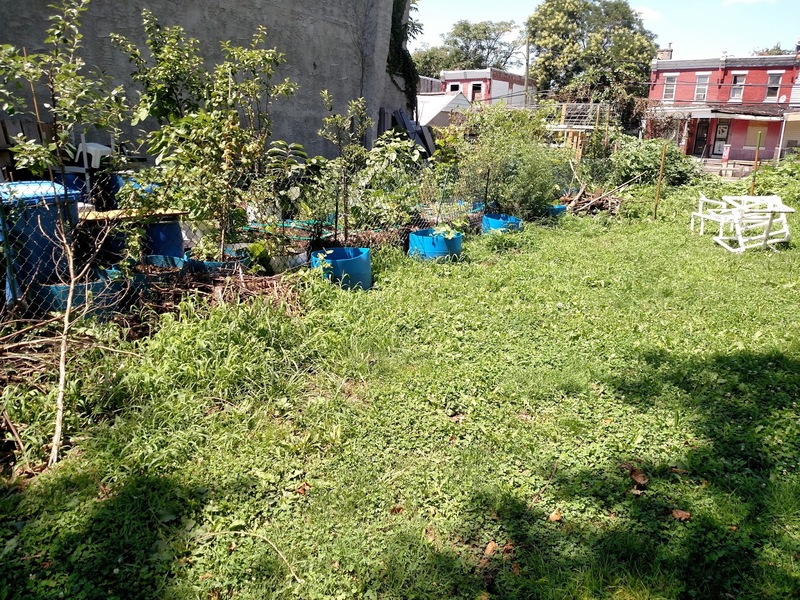 Last year she purchased a rowhome bordering nearly 1/2 acre of rare urban green. 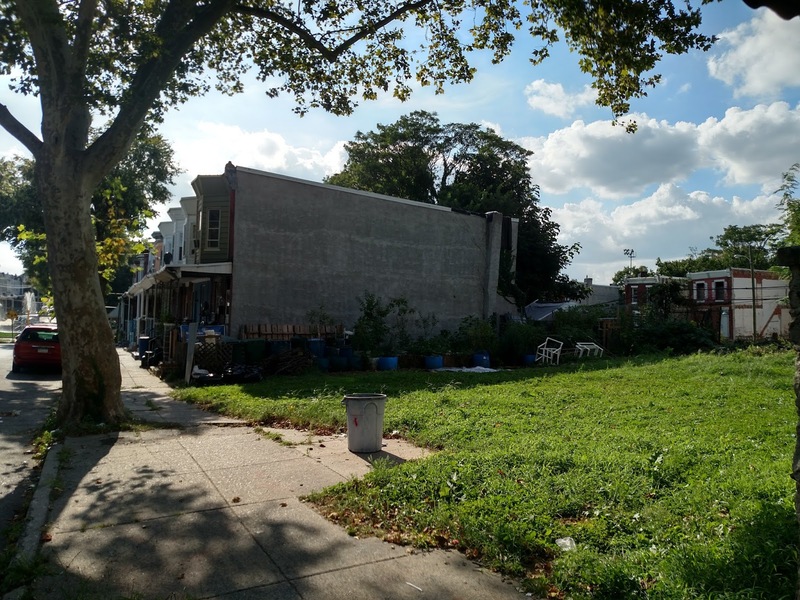 The open space consists of 21 abandoned properties, each about 800 square feet. Each was a former rowhome itself, long since forgotten and eventually bulldozed into its own basement and covered with a thin layer of topsoil. According to stage three of Julie's designs, this land will be a forest of fruit trees, gardens, ponds and grazing livestock. But this is stage one year one. So far Blue Marble Solutions (Julie's non-profit) has a greenhouse and a coup for chickens, rabbits and ducks, and one intensively gardened lot with 55-gallon fruit trees and straw-bale beds. The other 20 lots remain grass. Periodically mowed, they are a liability for the city and a buzzkill for Mother Earth. 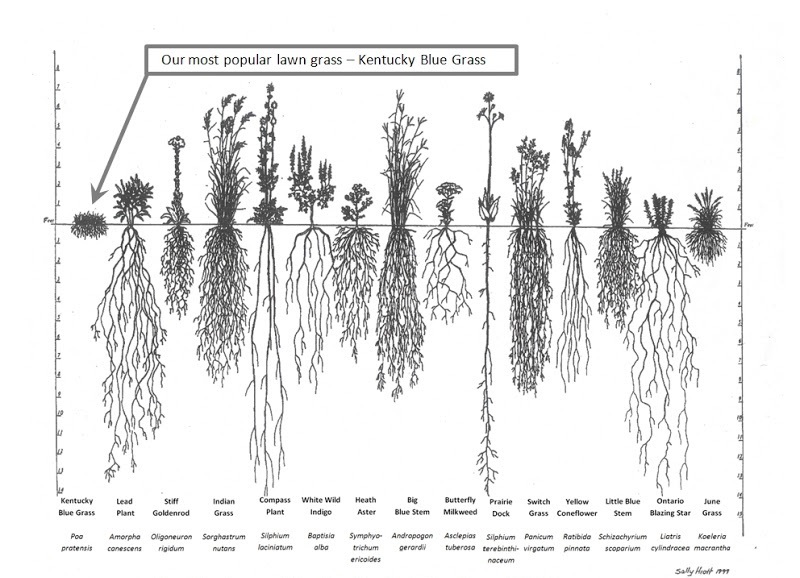 If we consider a healthy, water-absorbing, habitat-providing, carbon-sequestering ecosystem as being 10, 20 or even 30 feet deep, then these shallow grasses (and most lawns in America) are hardly better than a concrete parking lot. 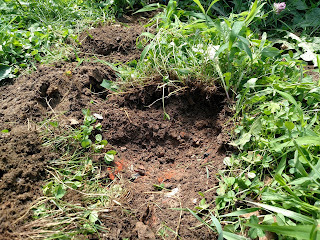 My Goal: build deeper, more fertile soil; to grow roots that will penetrate and decompose the demolished home below, add organic matter to the depths and draw nutrients to the surface, to improve the land for the fruit trees to come; to grow cover crops; to start the next succession. Thin layer of life covering a thick layer of death. 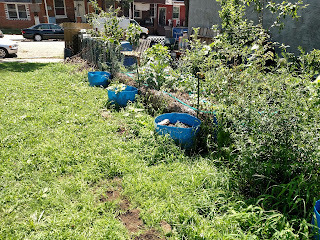 See Part 2 of Guerilla Gardening in Philly for updates. 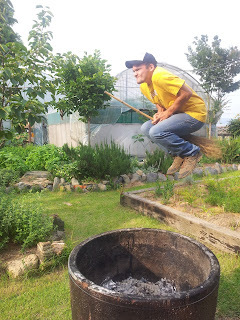 The Test Plots: to determine the best method. 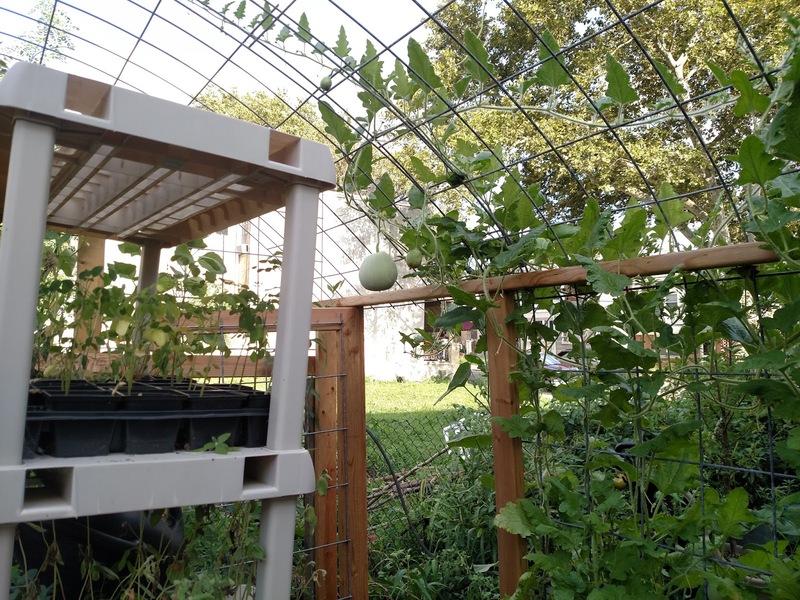 Three plots, long and narrow, each has similar amounts of sunlight and soil conditions. 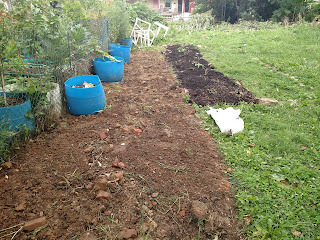 Each plot I equally sowed with seeds, then raked lightly and watered thoroughly. Plots right to left, The Till, The Additions, and The Nothing. The Till, 150 square feet. 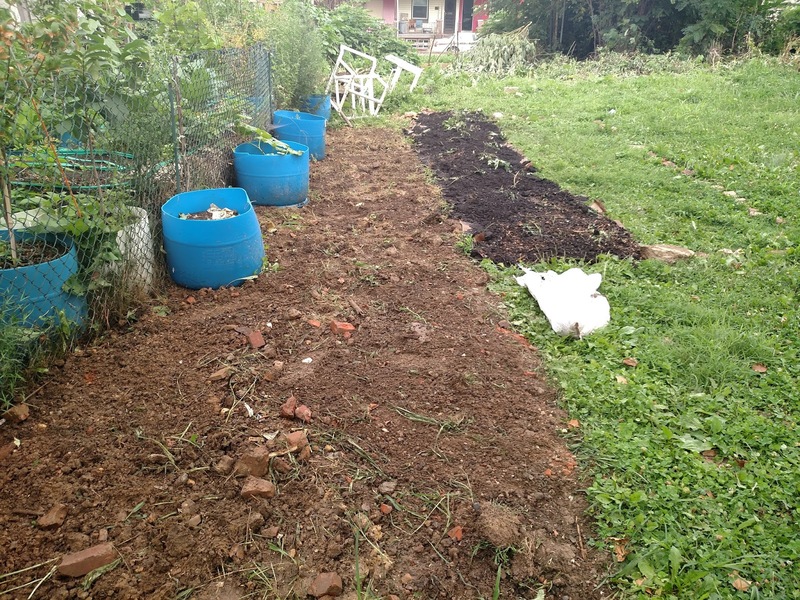 Dug and turned with a sharp spade and motivational music. The competing grasses are dead and buried, while soil is exposed and loose, perfect for germination. On a larger scale this method replicates a rototiller or a plow. The Additions, 80 square ft. This method requires a stack of cardboard and a lack of energy to continue digging. 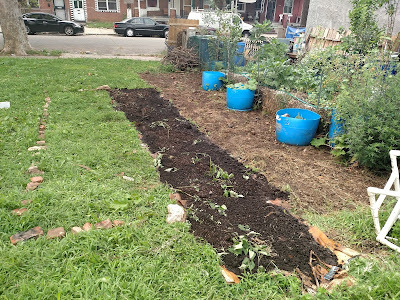 I simply covered the grass with cardboard, then with cut weeds, then with compost (courtesy of the Organic Recycling Center). The starved grasses and cut weeds will eventually decompose into soil, meanwhile the compost will germinate the cover crops, whose roots will then penetrate the whole package. The Nothing, 80 square feet. Sowed directly into the existing grass for comparison's sake. [Update]: morning after sowing, the lawnmowermen did their deed, possibly helping the cover crops by cutting back the competition. 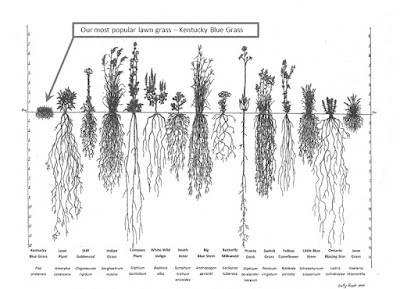 The Crops: Sweet Clover, Hairy Vetch, and common Oats are my three choices, based on their abilities to grow quickly, to tolerate and improve poor soils, and to cooperate with each other this fall, over winter and into next spring. 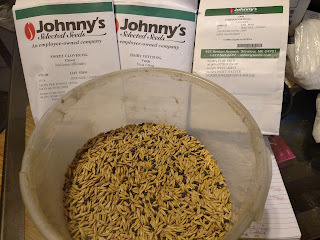 I researched and purchased them from the Green Manure page on Johnny's Seeds website, which I highly recommend and which provides the following info. 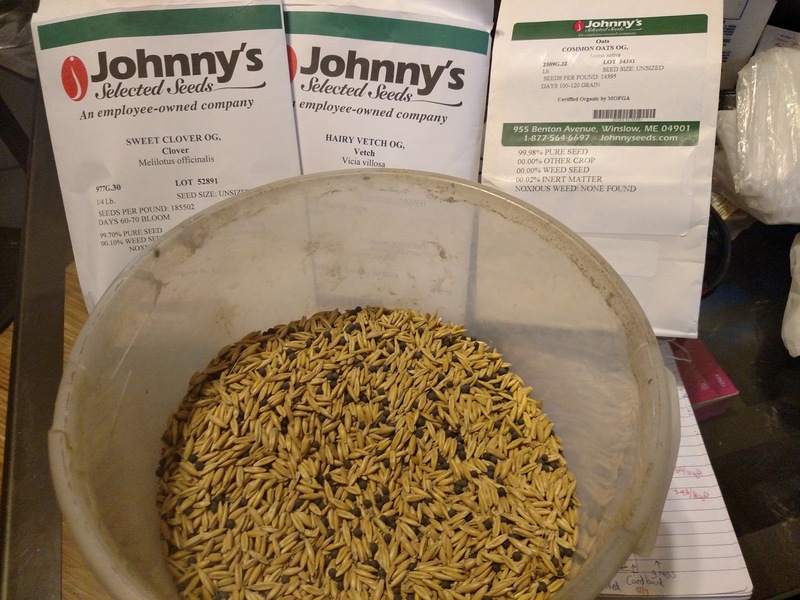 Seed mixture: sweet clover, hairy vetch and common oats. Below is another before and after shot of the site preparation. For an update and germination, see Guerilla Gardening in Philly, Update. The shadehouse/greenhouse at Blue Marble.